The name says it all! I’ve been working on this recipe for a while, and after lots of failed attempts I’m delighted with these gorgeous little bites of heaven. 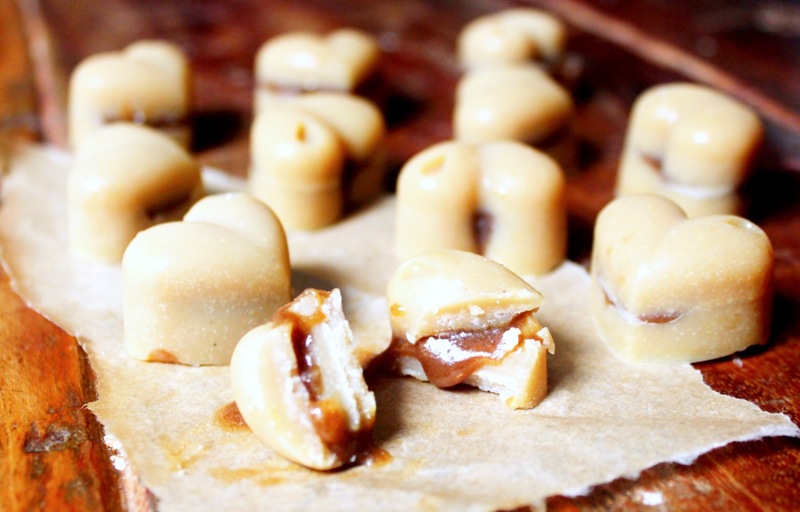 The caramel is insanely good, perfectly runny and sticky and the white chocolate is so creamy, it doesn’t get much better than one of these and a cup of tea. Spoil yourself (or someone else!) with these this Valentine’s day. Carefully stir in the coconut mixture and allow it to bubble into a rolling boil (adjust heat if needed). Let it bubble and simmer, stirring frequently, for 8-10 minutes, then take it off the heat. Pour it in to a bowl and pop it in the freezer to cool and thicken. To make the chocolate, combine the cacao butter, cashew butter and maple syrup in a small saucepan on medium heat. When they’re completely melted, take it off the heat and whisk well. You can use either a chocolate mold or a silicone ice tray to shape the chocolates. Pour about 1 teaspoon of the melted chocolate into the bottom of the mould to fill it 1/3 of the way. Pop them in the freezer to set for about 15 minutes. Set the rest of the melted chocolate aside. 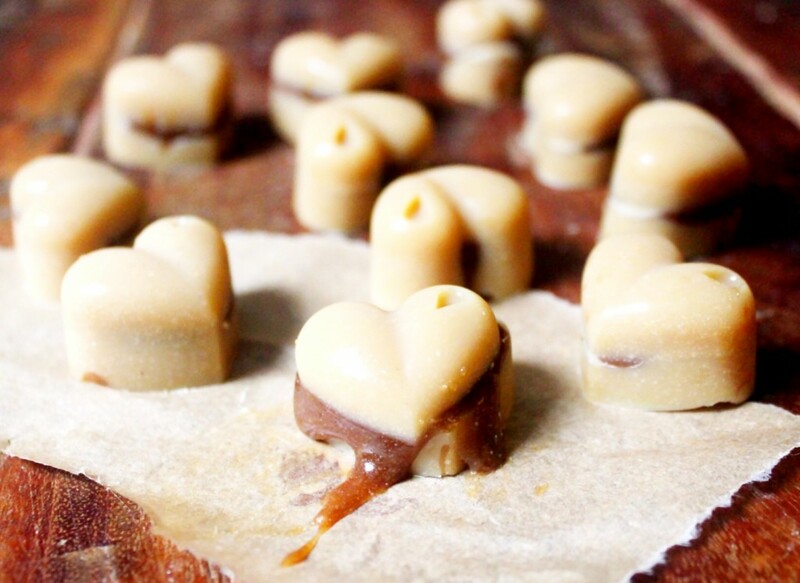 Take the chocolates and caramel out of the freezer and spoon a little caramel into each. Whisk the melted chocolate again and then pour another teaspoon of it onto each to fill the mould. 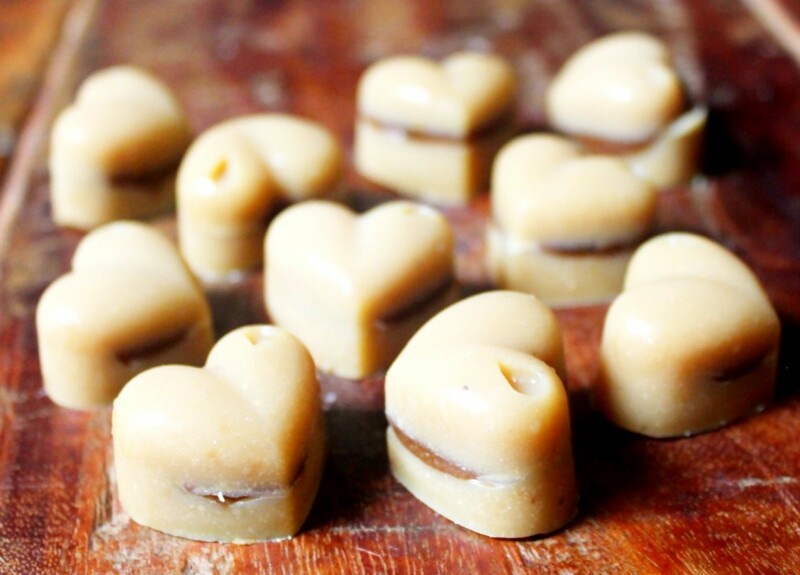 Hi There I need to make these tomorrow but I have tried my best to get cacao butter and can’t! What can I use as an alternative please?